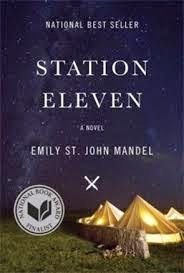 a book chick: "Station Eleven"
my take: I'd been reading a lot of good books. I was looking for a great one. I chatted one evening about this (first world) problem with friend Michele. We both lamented that elusive read that you don't want to put down and the one you want to share with everyone. And then this. I read it and wanted to discuss it with somebody. Hubby had to wait for me to read a couple other books on the Kindle before he could read it and I had to bide my time until we could finally talk about it. I have to say, I'm a little leery of post-apocalyptical fiction. It's always so ... depressing? violent? barren? The world created by Ms. Mandel is not barren, a bit depressing, a bit violent but also filled with art - the traveling theatre/symphony - and hope. I found the premise to be plausible and appreciated how she structured the novel (maybe a bit confusing at first as it's not linear) and how she peopled the novel. Ooh, looking forward to this one! Definitely in the mood for something great - thanks for finding it for me.